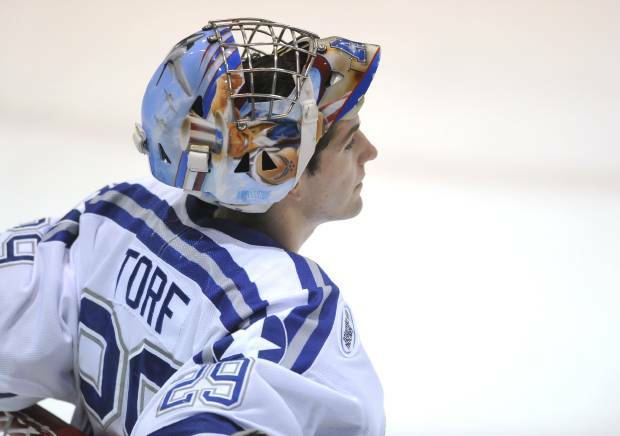 Air Force goaltender JEFF TORF, the highly-experienced senior from Hermosa Beach, California, who has already appeared at the prestigious NCAA men’s ice hockey tournament twice in his career, bounced back from a tough weekend in Alaska by blocking 59 of 62 shots faced in a pair of contests with traveling Penn State at the Cadet Ice Arena. A shorthanded goal seven and a half minutes into the final frame snapped a scoreless deadlock and an insurance tally less than three minutes later allowed a motivated AIR FORCE squad to defeat visiting PENN STATE 3-1 and complete the sweep of the two-game weekend series in Colorado Springs. Prior to the return match on Saturday night, Penn State head coach GUY GADOWSKY made several changes to the overall line-up in addition to tinkering with the Nittany Lions’ different line combinations, as well. As could have been expected, sophomore MATT SKOFF replaced the unspectacular freshman EAMON MCADAM in between the PSU pipes for the second contest with Air Force. Canadian legionnaire MIKE WILLIAMSON, another newcomer of the Nittany Lions who, like McAdam, had been drafted by a National Hockey League club last summer and had made his official NCAA collegiate debut in the 5-2 loss to the Falcons on Friday night, lost his place on the Penn State blue line for fellow freshman DAVID THOMPSON, the homegrown defenseman from Glen Mills. 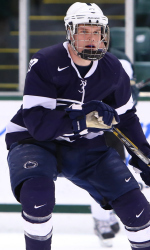 MICHAEL MCDONAGH, the hard-working senior from Wilmington, Massachusetts, who skated in 23 varsity games (1 go, 7 pts, + 1 def rating) for Penn State last season, made his first appearance of this new 2013/14 campaign at right wing on the fourth line. 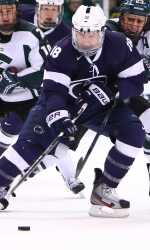 And RICKY DEROSA, the homegrown freshman from Aston, Pennsylvania, made his collegiate debut by centering the fourth line which also Penn State captain TOMMY OLCZYK. Making way on the Nittany Lions’ team sheet were two freshmen forwards, left wing DAVID GOODWIN and center DYLAN RICHARDS. The trio of right wing MAX GARDINER (27), center TAYLOR HOLSTROM (28) and left wing CASEY BAILEY (18) emerged as Penn State’s number one forward line and, collectively, totaled 26 goals (Bailey 14, Holstrom 9, Bailey 3) to account for a little more than one-third of all Nittany Lions’ scoring last term … after Penn State’s first thee contests to begin this brand new 2013/14 NCAA campaign, all three players comprising this important unit are each still to bulge the back of the net for the first time this season. Penn State, who certainly have one of the bigger teams in all of college ice hockey, immediately sought to establish a physical presence at both ends of the rink right from the outset of Saturday night’s tilt with Air Force. This would prevail all throughout the contest, even after the Nittany Lions’ Canadian legionnaire JONATHAN MILLEY, the gigantic (6’4″ 245 lbs) sophomore left wing from Gatineau, Quebec, went to the penalty box for slashing only 26 seconds into the match. And it was one that seemed to benefit Penn State, who, after looking a little bit tired on Friday night (as observed and reported by the Air Force radio announcers) were able to skate with the Falcons on level on level, albeit scoreless, terms for more than two periods. The game, itself, quickly developed into a bona fide duel between the two netminders facing each other at opposite ends of the rink. The Penn State goaltender Skoff, who had come into this match fashioning a resume of seven wins against two losses in his last nine starts (2.44 avg, .922 save pct), had to be sharp early and, ultimately, was called upon to make 15 saves in the first period alone. Meanwhile, the Nittany Lions came into the game more and more as time passed on and would find themselves outshooting Air Force 27-25 after two periods of play. It is to Air Force goaltender JEFF TORF’s enormous credit that Penn State did not get on the scoreboard ahead of its hosts; particularly towards the end of the second period, Torf came up with quality saves including a point-blank denial of Nittany Lions left wing CASEY BAILEY, the dangerous sophomore from Anchorage, Alaska, who led the fledgling NCAA varsity program in scoring last season (27 ga, 14 go, 27 pts, +3 def rating). Air Force right wing GEORGE MICHALKE (18) appeared in only five NCAA contests last season before suffering a devastating check from behind against Canisius College in Buffalo that left the diminutive (5’11″ 165 lbs) Falcon skater with a serious concussion that resulted in Michalke sitting out the remainder of the 2012/13 campaign. Penn State were presented a glorious opportunity when Air Force right wing RYAN DAU, a freshman from Hudson, Wisconsin, received a minor penalty for high sticking almost five minutes into the final period. But, with time winding down on the power play, Falcons left wing RYAN TIMAR, the senior from Novi, Michigan, made a diving play to poke the puck out of his own defensive zone and then led a charge up ice. This shorthanded rush culminated with a wide-open GEORGE MICHALKE, the redshirt junior right wing from Parma, Ohio, sending Air Force out in front 1-0. Less than three minutes later, the Falcons’ most leathal forward line struck to increase Penn State’s woes as right wing COLE GUNNER buried a one-time blast to score his second goal in as many nights against the visiting Nittany Lions. An undersized (5’9″ 170 lbs) junior from Richfield, Minnesota, who shot seven goals in 37 games for Air Force last season, is now in the midst of a modest three-game goal-scoring streak at present. CHAD DEMERS, the junior center from Grafton, North Dakota, earned an assist on the play and enjoyed a very productive weekend, himself, with a goal and five points in the two-game set with Penn State. With Torf in such fine form, it was Gunner’s strike that left the Nittany Lions with a genuine mountain to climb. Michalke officially confirmed the result by netting his second goal with a rebound at the 16:41 mark of the third period. This prompted the Penn State head coach Gadowsky to replace his netminder with a sixth attacker on the ice and, surprisingly, the play worked almost immediately, as well. It was DeRosa, the 21-year-old freshman who is the product of Cardinal O’Hara HS in Philadelphia that played for the Port Huron Fighting Falcons in the North American Hockey League last season, who finally spoiled Torf’s shutout bid and notched his first collegiate goal in the process. 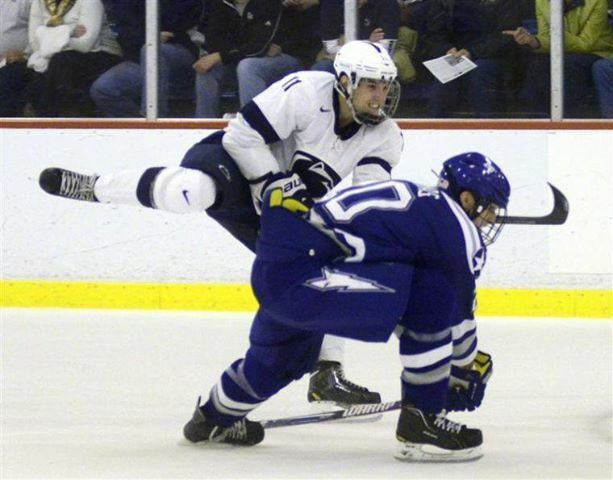 Air Force defenseman DAN WEISSENHOFFER (11) decisively wins his battle for the loose puck along the boards with Penn State freshman left wing DAVID GOODWIN during the NCAA non-conference contest watched by a sell-out crowd at the Cadet Ice Arena in Colorado Springs, Colorado. A pair of early goals left the visitors to chase a game it never really ever did look capable of actually catching as a rebounding AIR FORCE effectively subdued visiting PENN STATE 5-2 in the first of two weekend contests at elevation out West in Colorado Springs. Picking up right where it left off in its season-opener with Army, the Nittany Lions continued their parade to the penalty box early when Canadian legionnaire DAVID GLEN, the sophomore from Fort Saskatchewan, Alberta, who led Penn State with 16 goals in 27 games last term, was sent to the sin bin for slashing only four and a half minutes into this non-conference match with Air Force. The Falcons, who had gone 0-for-12 with man advantage in losing both of its games at the Kendall Hockey Classic in Alaska last weekend, capitalized immediately and would require only 26 seconds for junior left wing SCOTT HOLM to shoot the puck past Penn State’s highly-touted freshman goaltender EAMON MCADAM. Air Force quickly doubled their margin exactly 70 seconds later when center BEN CAREY, the homegrown sophomore from Centennial, Colorado, skated the length of the ice before setting up senior left wing TONY THOMAS in the slot. Two goals conceded on just six shots faced could hardly have been what the shell-shocked McAdam, a third round selection (# 70 overall) of the New York Islanders at the 2013 National Hockey League Draft this past summer, had been hoping for on the occasion of his very first collegiate start. Penn State were completely overwhelmed and outshot 7-1 by Air Force at the outset but still managed to steady itself with a goal of its own just nine and a half minutes into the contest at the Cadet Ice Arena … promising sophomore left wing ERIC SCHEID, who scored six goals in thirty appearances for the University of Alaska – Anchorage during the 2010/11 NCAA campaign before making his way to Happy Valley, scored his second goal in as many games for the Nittany Lions on a rebound in front. The first line of Air Force featured prominently in the Falcons’ 5-2 victory over Penn State …… right wing COLE GUNNER (22), the junior from Richfield, Minnesota, who totaled 29 points in 37 games for the Falcons last season, and center CHAD DEMERS (Grafton, North Dakota) each collected a goal and two assists while left wing SCOTT HOLM (Plymouth, Minnesota) added a goal and an assist in the triumph, as well. Air Force did seem to dictate the pace and flow throughout while winning more than its fair share of foot races and 50/50 pucks, as well. The Falcons scored a critical goal to go in front 3-1 with a little more than seven minutes remaining in the middle frame when junior center CHAD DEMERS, standing on the hash marks, made a nice play to redirect a puck past the debutant McAdam. The pivotal moment of the match not so long afterwards when Penn State’s unlucky right wing MAX GARDINER, the third round NHL draft pick of the St. Louis Blues who led Penn State with 19 assists last season, clanked his shot off the iron. 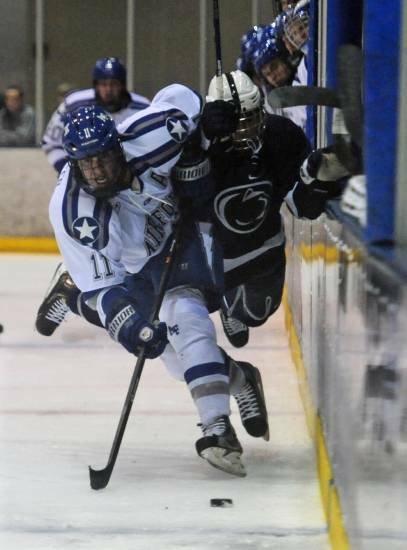 The importance of this event became obvious a mere 15-20 seconds later when junior right wing COLE GUNNER finished off a play involving his linemates Holm and Demers with aplomb to score his second goal of this new 2013/14 NCAA season and essentially slam the door shut on Penn State. Thomas, the senior from South Lyon, Michigan, who is the highest-scoring player to return to the Falcons squad this season having shot 10 goals in 37 games last term, scored his second goal of the game to give Air Force a 5-1 lead almost five minutes into the third period on a strange, knuckleballish backhander that bounced off of McAdam’s glove. Penn State’s Canadian legionnaire LUKE JUHA, the sophomore defenseman from Mississauga, Ontario, salvaged a measure of pride with a goal for the Nittany Lions late in the game. Juha, of course, netted his one and only goal of the 2012/13 NCAA season against the Air Force roughly a year ago in Happy Valley. Penn State left wing ERIC SCHEID (19), the redshirt sophomore from Blaine, Minnesota, who is a transfer from the University of Alaska at Anchorage, circles behind the net as Air Force goaltender JEFF TORF, the highly-experienced senior from Hermosa Beach, California, prepares to smother the puck during the NCAA non-conference clash watched by the sell-out crowd of 2,519 spectators at the Cadet Ice Arena in Colorado Springs. Air Force right wing COLE GUNNER (22), the creative junior from Richfield, Minnesota, who is the highest scoring Falcons skater (37 ga, 7 go, 29 pts) to return from last season’s squad, was the only player from his school to be selected to the tournament all-star team at the Kendall Hockey Classic hosted by the University of Alaska – Anchorage this past weekend. Much like the United States Military Academy at West Point, the stated purpose of the UNITED STATES AIR FORCE ACADEMY is not to focus on playing collegiate ice hockey at the elite Divison I-A level. Nevertheless, the Air Force program capably steered by FRANK SERRATORE has, in recent seasons, has been enjoying the most outstanding era in the school’s entire history. Last season, the Falcons compiled a record of 17 wins against 13 losses with seven ties and failed to qualify for the prestigious NCAA men’s ice hockey tournament for only the second time in the last seven years. AIR FORCE are certainly still looking to take flight this term having lost its first two games of the season at the Kendall Hockey Classic held in Anchorage, Alaska, this past weekend. 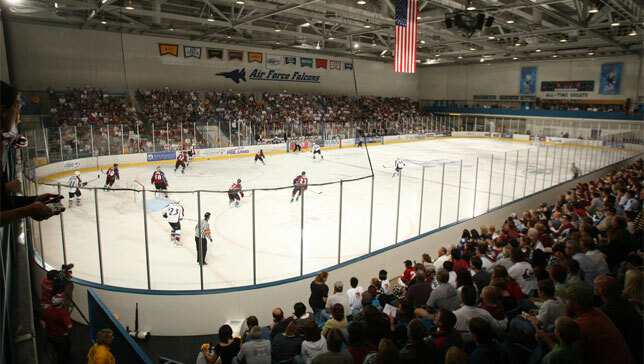 A decisive 6-1 defeat at the hands of the University of Alaska – Fairbanks, a lopsided contest in which Air Force used three different goaltenders, and a tough 4-2 loss to the University of Alaska – Anchorage, a game which saw the Seawolves score the winning goal with only three seconds left, were hardly the results that the Falcons head coach could have been hoping for. Without question, Air Force will be a very determined and hungry squad when the visiting Penn State Nittany Lions come calling upon the Cadet Ice Arena in Colorado Springs. The homestanding Falcons will also benefit from the fact that it is the Air Force team and not the opposition who are normally acclimated to the local elevation of 7,258 feet above sea level. Air Force graduated three of its top six scorers from last season including the top two point-producers, left wing KYLE DELAURELL (37 ga, 19 go, 36 pts) and center STEPHEN CAREW (37 ga, 12 go, 29 pts). The Falcons also lost two of its regular top six defensemen from last term including the blueliner with the best plus/minus rating, ERIC ALTMAN (29 ga, 2 go, 8 pts, + 15 def rat). 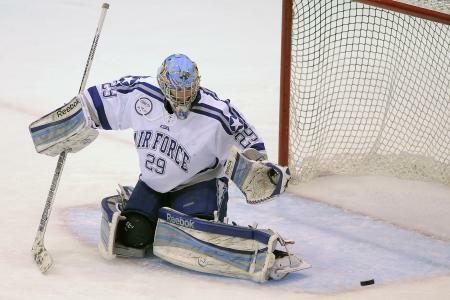 The only position where Air Force remained virtually unscathed by the annual commencement process was found between the pipes – DAVID BOSNER, a career backup with exactly four games in four years to his credit (two of those appearances having come last season) has duly departed having served his school faithfully. Air Force goaltender JASON TORF (29) appeared in 37 games and put up respectable numbers (2.36 avg, .918 save pct) for the Falcons last term but the experienced senior shot-stopper from Hermosa Beach, California, was clearly not sharp in Alaska on the opening weekend of this 2013/14 NCAA college hockey season. The Falcons were most clearly not beneficiaries of spectacular goaltending at the Kendall Hockey Classic. JASON TORF, the senior who made 89 appearances (2.41 avg, .916 save pct) in his first three seasons with Air Force, is expected to provide the Falcons with reliable netminding but surrendered three goals while facing just five shots in almost fourteen minutes of play against the University of Alaska – Fairbanks and was yanked before the first period concluded. PAUL MOBERG, the junior from Forest Lake, Minnesota, made his first appearance since his freshman season in relief but fared little better against the Nanooks conceding three goals on just nine shots. CHRIS TRUEHL, the freshman from Stoughton, Wisconsin, was able to stop all three shots he faced in the final fourteen minutes of the Falcons’ two fruitless games in Alaska last weekend. There is no doubt that Torf will continue as the Air Force number one despite his less than impressive save percentage (.750 after the first two contests) this season. It was the 23-year-old senior who started both of the Falcons’ contests against Penn State and blocked 54 of 58 shots (.931 save pct) by the Nittany Lions while allowing four goals in two games at State College roughly a year ago. 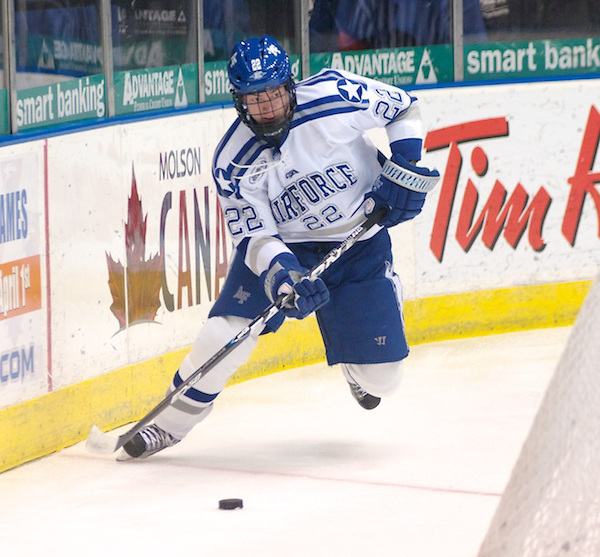 It is also Torf who has been first choice for Air Force on its last two appearances at the annual NCAA men’s ice hockey tournament (a 2-0 loss to eventual champion Boston College as well as a 2-1 overtime defeat by Yale). 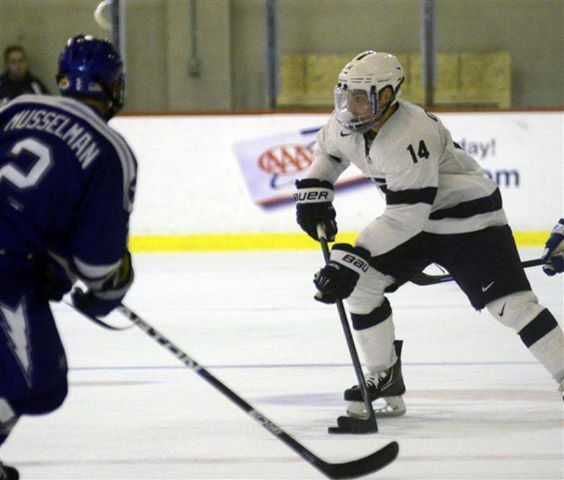 Air Force defenseman ADAM MCKENZIE (6), the undersized (5’11″ 178 lbs) senior from Petaluma, California, who easily led all Falcons blueliners last term with both eight goals and 20 points, was selected to the pre-season conference all-star team by the Atlantic Hockey Media Association. The Air Force defensive corps as a whole can be fairly classified as a bit undersized, with four of the Falcons’ six rearguards who skated at the Kendall Hockey Classic officially listed at 184 pounds or less although, oddly enough, the most influential of all the Air Force defensemen just so happens to be the one that actually weighs the least. Senior ADAM MCKENZIE has been a regular since his freshman campaign and contested 107 NCAA games (15 go, 42 as, 57 pts, + 26 def rating) in his first three years at Air Force. Like the goaltender Torf behind him, McKenzie also skated for the Falcons against both Yale University as well as Boston College at the annual NCAA men’s ice hockey tournament in 2011 and 2012, respectively. Junior DAN WEISSENHOFER (6’2″ 200 lbs), a stay-at-home type from Naperville, Illinois, was also a regular in his first two seasons (72 ga, 1 go, 19 as, 20 pts, + 25 def rating) at Air Force and comprises the Falcons’ number one defense pairing with MacKenzie. 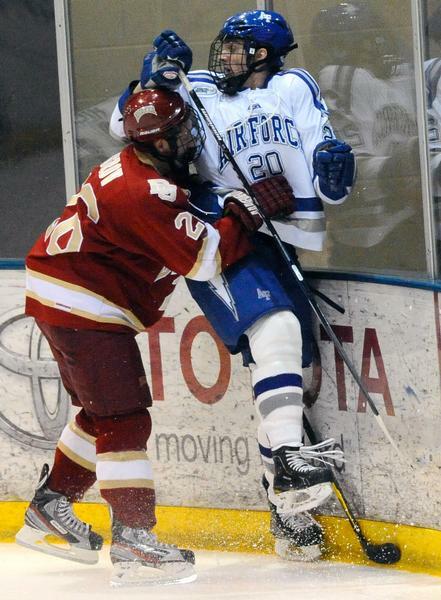 The largest of the Air Force defensemen is MIKE MCDONALD (6’5″ 215 lbs), the junior from Mahtomedi, Minnesota, who made just two appearances for the Falcons as a freshman but skated in 36 games (2 go, 7 pts, + 4 def rating) as a sophomore last term. Air Force do have one freshman blueliner who, in fact, made his first two collegiate appearances at the Kendall Hockey Classic in Alaska — 20-year-old JOHNNY HRABOVSKY (5’11″ 184 lbs) from Hummelstown, Pennsylvania. Air Force left wing TIM THOMAS (20), the experienced senior with good size (6’3″ 200 lbs) from South Lyon, Michigan, who participated in 114 NCAA games (20 go, 36 as, 56 pts, + 15 def rating) over the course of his first three collegiate seasons, heads the list of all players returning to the Falcons’ program this fall having shot 10 goals in 37 NCAA games last term. Air Force also featured a few smaller players at forward, including three who are listed at 170 pounds or less, during the Kendall Hockey Classic although two of those players — junior left wing COLE GUNNER (5’9″ 170 lbs) and senior center GEORGE MICHALKE (5’11″ 165 lbs) — did net goals for the Falcons this past weekend in Alaska. Gunner, senior left wing TONY THOMAS (37 ga, 10 go, 28 pts) and center CHAD DEMERS, the junior from Grafton, North Dakota, who totaled nine goals and 24 points during the 2012/13 campaign, are key players who finished # 3, # 4 and # 5 on the Air Force scoring chart last season. JASON FABIAN (6’4″ 195 lbs), the senior from Roseau, Minnesota, who scored seven goals and added 12 assists in 36 games for the Falcons a year ago, is the biggest of the the Air Force centers while left wing SCOTT HOLM (35 ga, 8 go, 17 pts), the junior from Plymouth, Minnesota, is another forward with a good amount of experience. Supporters of the Falcons are hoping that lanky right wing BEN PERSIAN from Orono, Minnesota (30 ga, 6 go, 11 pts) and smallish center BEN CAREY (33 ga, 6 go, 15 pts), the homegrown product of Centennial, Colorado, can both build on a positive rookie seasons. 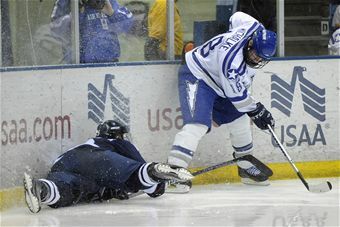 The one freshman forward who appeared in both contests for Air Force at the Kendall Hockey Classic in Alaska was A.J. REID (5’11″ 190 lbs), the right wing from Lakeville, Minnesota. Penn State right wing KENNY BROOKS, the freshman from Las Vegas, Nevada, who scored two goals and added ten assists skating in 25 of the Nittany Lions’ 27 games last season, shields the puck from Air Force defenseman TREVOR WALDOCH (77), the freshman from Forest Lake, Minnesota, during the NCAA non-conference clash at the little Greenberg Pavilion on November 10, 2012. Up and down results from PENN STATE, then, as the Nittany Lions and the visitors from the Air Force Academy split a pair of 5-1 decisions on consecutive nights in early November at the little Greenberg Pavilion last season. After the Falcons had taken the first of the two games with Penn State, a gracious Air Force coach FRANK SERRATORE stated publically that his team had received an early Christmas present warmly. In response, Nittany Lions head coach GUY GADOWSKY made a few changes to the Penn State line-up and installed a new goaltender, as well, for the return affair in State College. Canadian legionnaire LUKE JUHA, the freshman defenseman from Mississauga, Ontario, netted what would prove to be his only goal of the 2012/13 season on a big slapshot from the point and, in doing so, was credited with the game-winner as Penn State earned a weekend split with the visiting Falcons. The Nittany Lions’ emerging freshmen pair of CASEY BAILEY, the tall left wing from Anchorage, Alaska, and sharp-shooting Canadian import DAVID GLEN also each tallied a goal for Penn State in the second meeting with Air Force. It was in the second game against the Air Force on Saturday night that Penn State center MICHAEL MCDONAGH, the hard-working junior from Wilmington, Massachusetts, scored his one and only goal of the 2012/13 campaign into an empty net — two weeks earlier, it was McDonagh who made hockey history by becoming the first Nittany Lions player to ever record three assists in an NCAA Divison I-A contest as Penn State upended Sacred Heart University 6-3 on the road in Milford, Connecticut. Penn State captain TOMMY OLCZYK (14), the sophomore from Long Grove, Illinois, who saw extensive ice time with the penalty killing unit during the Nittany Lions’ inaugural varsity season at the NCAA Division I-A level, looks to pass the puck as Air Force defenseman JACOB MUSSELMAN (2), the undersized junior from Littleton, Colorado, observes at the faithful little Greenberg Ice Pavilion in State College, Pennsylvania. Air Force left wing TONY THOMAS (20), the junior from South Lyon, Michigan, cannot prevent the shot from Penn State’s prolific Canadian legionnaire DAVID GLEN (11), the freshman center from Fort Saskatchewan, Alberta, who led all Nittany Lions with 16 goals during the 2012/13 campaign, during the NCAA non-conference clash at the modest Greenberg Pavilion. Penn State defenseman CONNOR VARLEY (3), the homegrown freshman from Lansdale, Pennsylvania, who led all defensemen on head coach Guy Gadowsky’s squad with 12 points (four goals) during the historic 2012/13 season, capped off the Nittany Lions’ first-ever weekend series with the Air Force Academy by scoring his very first collegiate goal into an empty net at the Greenberg Pavilion in State College, Pennsylvania. Copyright © 2013 WORLD HOCKEY. Powered by WordPress and A Dream to Host theme by Art of Blog.